I have wanted to be an emergency room nurse for as long as I can remember when I was in nursing school. Perhaps it was the TV show “ER” and the excitement of something new and exciting every shift and not the same-old, same-old that can accompanying working on a long-term or even acute care unit. It took me 3 years of working in pediatrics and in the operating room to eventually land me working in rural ER’s and I’m thankful for the experiences I had before I started. I love working in ER, but now that I am more of a part-time nurse and part-time stay-at-home-mom, I would love to branch our my nursing skills into the world of public health, which is something I NEVER thought I’d say! One of my favourite jobs was being an OR nurse and getting the opportunity to travel to Ecuador. Public health would bring the new task of traveling to people’s homes to do home visits and carrying various supplies with me. I would need to carry files of paperwork including patient charts and brochures, tools like my stethoscope, monitors, scissors, tape, hand sanitizer, pens, algorithms, snacks, medications…the list goes on and on! If I ever journey into the world of public health, which I hope to one day, I’m happy to use my new Nurse First bag to it’s full potential. This is the front of the bag opened up. There are mesh pockets which I’ve put some personal items into and the flap has another large mesh, zippered pocket too. On the outside is a pocket which I’ve put my name badges and pens on the outside. Looking from the top, it has a removable file folder, which I’ve placed a binder in and some papers, two spots on either side for water bottles (or anything else) and an adjustable divider for 2 compartments, or 1 large compartment. I’ve put my some snacks in one size and my stethoscope and a few other things in the other side. There’s also a red sharps container pocket with a bioharzard symbol on it, which I wouldn’t need to use for my current job. On the back side is another pocket that opens, very similar to the front where I’ve put some more pens, my scissors, a mosquito clamp, my ACLS algorithm book and it also has removable organizer pockets which I’ve placed my certifications in. Mark has generously provided me with a Nurse First bag for the purposes of this blog post and is also providing two more for giveaways! One for a Canadian reader and one for an American reader. This giveaway is open to Canadians and Americans 18 years and older, full contest details available here. Good luck, I hope you enjoy this bag as much as I do and it will make a great belated Christmas present for you or a nurse you love! 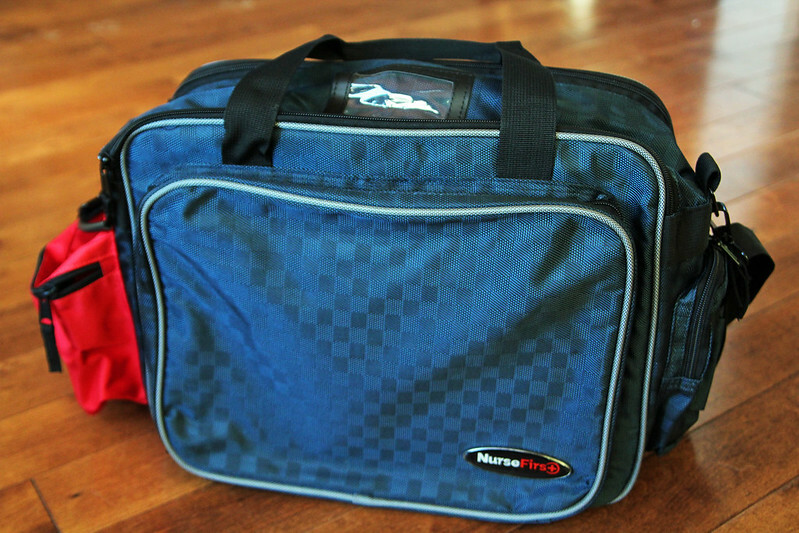 Disclosure: I was provided a Nurse First Bag and compensated for this blog post. All opinions are my own. Where can this bag be purchased?? My mom is a nurse and I am sure she could find a good use for this bag! I am a farmer in central Alberta and my wife is a nurse. She would love to have this bag. I have a friend that is a nurse here in rural Manitoba. I think it’s a well-thought-out bag and would be a great gift! My sister is a nurse here in Winnipeg, but she will be leaving next fall to pursue a nursing adventure in Australia. This bag would be wonderful for her to work out of, and a beautiful reminder of her family back in Canada. I'm not a nurse but would love to give it to two nurses from my transplant floor I was on at Cleveland Clinic in Ohio. I had an intestinal transplant and eating food for the first time in 6 years. Doing Awesome thanks to God and wonderful Dr's and nurses. Congrats, Jamie! You are a winner! Check your email and respond to claim your prize! Wow — what a neat bag idea. I am nurse of times past, but my daughter is also a nurse working abroad in a country where she needs to carry supplies along with her- this would be perfect. What a great idea! My aunt is a nurse and she would be using this bag. Love all the little pockets. 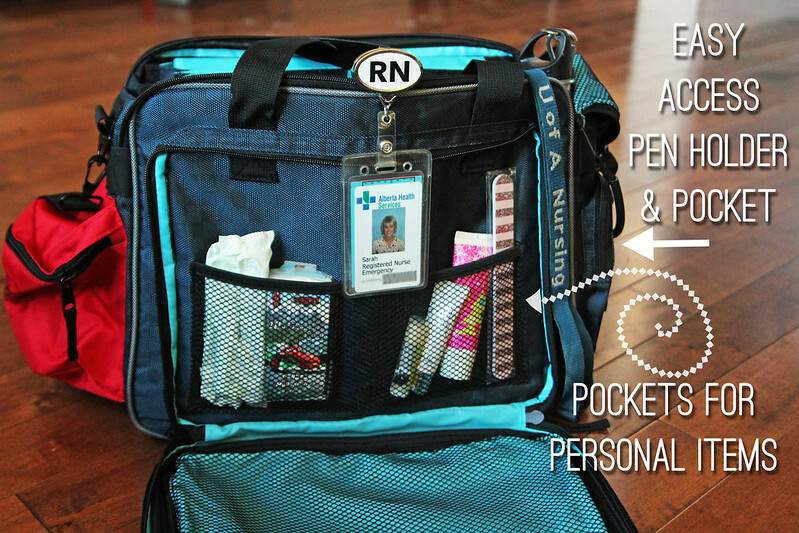 Our daughter, Vicki, is also an ER nurse and would love this bag…Love your giveaways! Yay for rural ER! I work both rural ER and medicine but emerg is totally my jam. Love the organization of this bag! This would be perfect for Home Care! My current bag is almost done for. I’m a home care RN and this bag would be great for carrying around everything I need! I am also a nurse, well NP and a farmers wife. This kit would help me at work and home! Love your blog! As a nurse in a rural acute hospital this would be perfect for me. It would help to keep everything organized and neat. I have not been able to find a bag that can achieve this that yet. This bag looks so amazing!!! Congrats you are a winner! Check your email and respond! My SIL Sarah is a LC and would be useful to carry around all her paperwork! This bag looks amazing! I work as a surgical nurse in a small rural hospital, but being a small critical access facility, I often find myself working Emergency Department as an extra set of hands when things get wild! I always find myself digging through my bulky bag trying to find my algorithm cards and supplies when I’m quickly pulled out to help. This bag looks like it would solve that issue! I love the organizational aspect of it and could definitely use this daily! As a nurse practitioner, this would be amazing! For me!!!! Cause I’m a nurse too! That would come in handy for me as a volunteer EMT too. I’ve thought a little bit about public health nursing too. Like you, it’s not something I’d ever considered doing. My husband would love to have this bag! He’d have it in his pickup all the time since he is the volunteer fire chief and will be taking the emergency responder classes next month. This is a great idea! I would give it to my brother-in-law who just became an EMT. My daughter is a nurse – this would be for her! I'm not a nurse myself, but have a friend who is. So would love to win the bag for her. Looks like a super good bag! My recent post Christmas Blessings! This bag would be great for my sister. After years of hard work she now has a permeant position. Couldn’t be more proud of her! Hi Sarah. This bag would be a great gift for my wife. A mom of 4, soon to be 5, would really benefit from this bag. 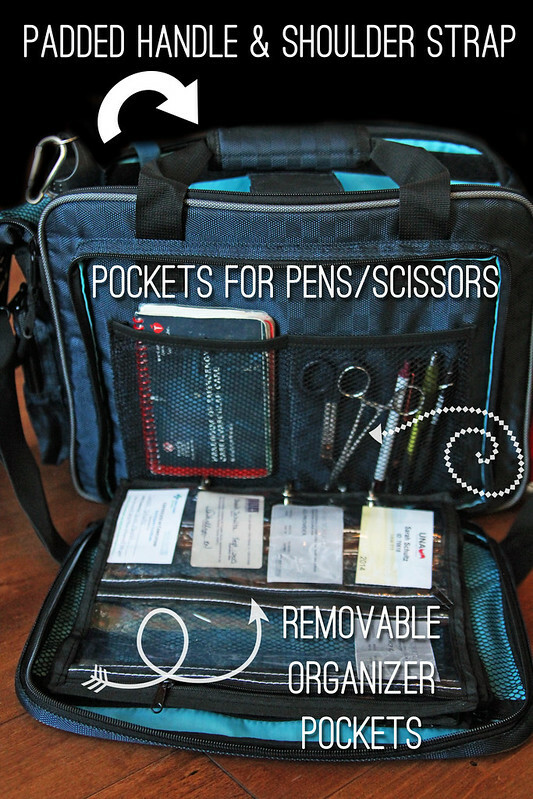 Would make for a great diaper bag to help keep things organized. My sister-in-law will be graduating from nursing in March and this would be the perfect graduation present for her! Lots of compartments and it looks like a very sleek bag! Yes! Perfect grad gift for a nursing student! 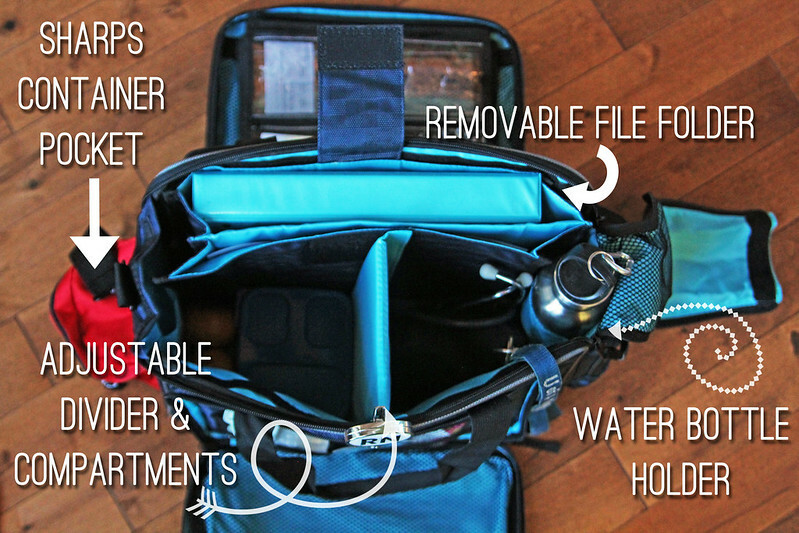 When I was first looking into this bag I thought it would only be good for a traveling health-type nurse…but once I started transferring all my stuff in it…LOVE IT and so excited to use it! !